Dexter Philip Oxford, III "Oxie"
The inspiration behind the Bear Tavern Elementary School ox was the school colors (blue and white) and several art projects that students have enjoyed completing this year and in years past. The design pulls mostly from projects that have studied the Element of Art: Line. This past school year, students in 4th and 5th grades each explored line designs called “zentangles” in projects that allowed students to explore line designs in a relaxing, creative manner. “It is important to me to see students make their mark and expand on it to a point they never imagined. My 4th and 5th graders did that this year in two totally different projects- one involving animals, and the other a still life”. In 2011, Mrs. Johnson created a temporary, collaborative installation at school by having students take a few moments each class period to create a simple doodle using Sharpie marker on Post-It notes. What resulted was a colorful, hard-not-to-lean-in-and-inspect “Doodle Wall” of her students little drawings. The mix of freestyle drawing and utilizing learned knowledge of LINE yielded the Bear Tavern ox. 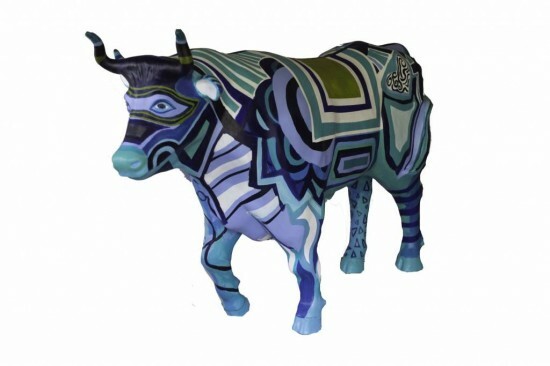 The ox was jump-started during the Bear Tavern annual art show this year and called on the school community to jump in and “help paint the ox” which was later named Dexter Philip Oxford, III or simply “Oxie”. The name is a combination of names suggested by students.